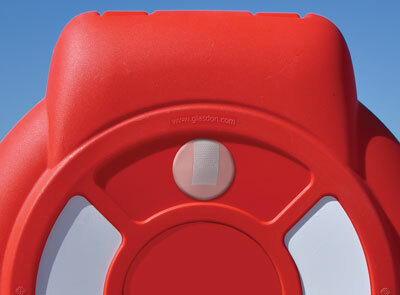 The Glasdon Guardian™ Lifebuoy Housing unit offers the ideal protection for lifebuoys and the B-Line™ rescue buoy. The high visibility and design of the unit makes it easily recognisable in an emergency. Rope options only available when purchasing Lifebuoy. The Guardian Lifebuoy Housing is a premier product at a very affordable price. Built with Durapol® material, the unit can withstand extremes of temperature, to protect the life-saving devices inside from harmful UV which can degrade the equipment. The Housings also act as a deterrent to vandals and thieves, reducing the frequency of costly Lifebuoy replacement. 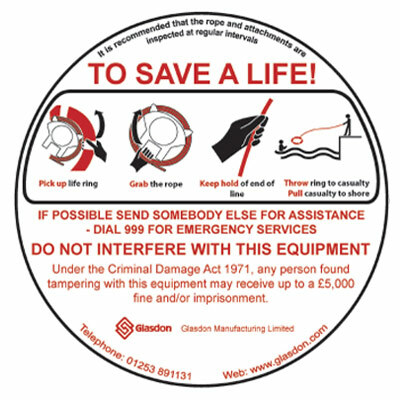 Glasdon lifebuoys are fully compliant with Chapter III of the Life Saving Appliances code as per the International Convention for the Safety of Life at Sea (SOLAS). The Guardian™ Lifebuoy Housing is available in two sizes and can be wall, rail or post mounted. The 750 Housing can hold up to two B-Line™ throwing buoys or one 750mm or 600mm lifebuoy. 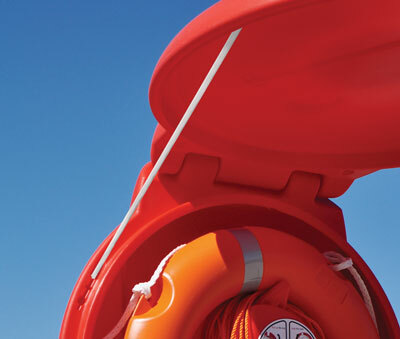 The 600 Housing can hold up to two B-Line™ throwing buoys or one 600mm lifebuoy. 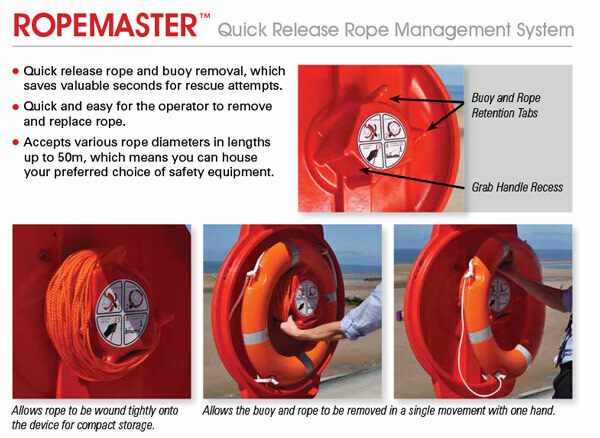 Ropemaster™ Quick Release Rope Management System saves valuable seconds for rescue attempts. Strong knuckle hinge and hinge rod resists corrosion and vandalism. Water seal minimises damage to rope & buoy from exposure to salt water. 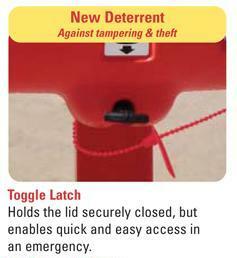 Toggle latch reduces risk of door opening in high wind or wave impacts. Simple graphical instructions inform the rescuer how the equipment should be used. Choice of three fixing methods - post-mounting, rail-mounting or wall-mounting. Post-mounting fixing available with either surface-mounting post or below-ground installation. 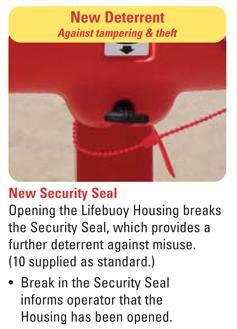 Security seal provides a deterrent against misuse and informs the operator that the housing has been opened. 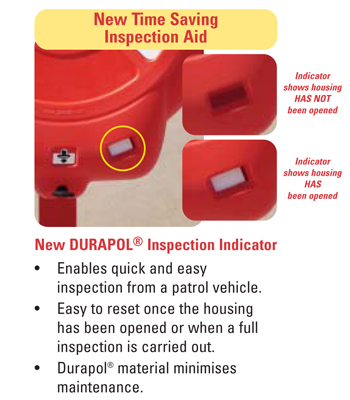 New Durapol® Inspection Indicator enables quick and easy inspection without leaving your patrol vehicle. Tough polyethylene lifebuoys (available as an option) are drop-tested to over 30 metres and supplied with high visibility yellow grab lines and class 1 retroreflective banding. Lifebuoys are supplied with a 30m throwing rope (8mm diameter) as standard. Alternative ropes are available - please see the "rope" option above for more details. Post: Mild Steel with Armortec® coating. Drawings from the sketchbooks of Leonardo da Vinci from the 16th century contain primitive designs for a diving suit and lifebelt, but it wasn't until the early 19th century that recognisable life-saving devices began to appear in regular use. Learn more about how to protect and preserve lifesaving devices with Guardian™ Lifebuoy Housings. The International Convention for the Safety of Life at Sea (SOLAS) ensures that merchant ships meet minimum safety standards in construction, equipment and operation. While prevention of accidents should always be the focus of a water safety strategy, well-maintained rescue equipment that is fit for purpose can frequently avert a tragedy.